Meet Fred, the Dairy Queen Cockroach! I went to Dairy Queen today. My wife and I like to stop by for a Blizzard occasionally, and today was one of those occasions. This time she got a small Blizzard and I got a medium chocolate malt. The malt came with a lid on it, so I never opened the lid but just poked the straw through the little X-cut in the center and started in. When I was about 3/4 done with it, I felt something kind of dry come out of the straw into my mouth. At first I thought it might be some dry malt powder or something, but when it didn't seem to dissolve I picked up a napkin and .... There he was!!!! me: "This just came out of my straw when I was drinking this malt." her: "Well, I don't know what that is." her: "Well, that straw was sealed in a paper wrapper." 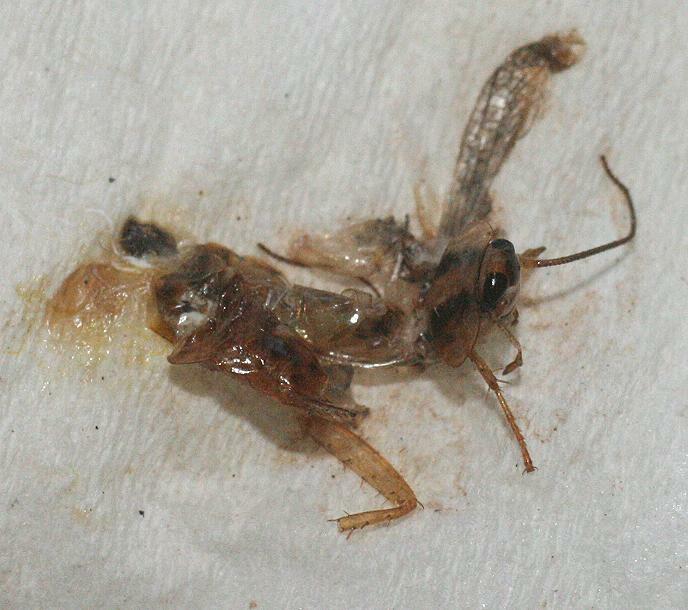 me: "Yes, I know that, I expect that the cockroach was in the malt." her: "Well, I didn't put it in there on purpose." me: "I didn't think you put it there on purpose, but you fed me a cockroach!" her: "Well, I don't know how he got in there. I didn't put him there." me: "I don't think there's much question that he was in there." her: "I made that malt myself, I just put in the ice cream, and the malt...."
me: "Do you feed everybody cockroaches?" her: "No, you're the first one. This is a clean restaurant." me: "Well, I think maybe it's not clean enough." her: "Well, I don't know what to do about it." me: "Do you suppose you could at least give me my money back?" She did give me my money back (though she had never voluntarily offered it, nor an apology), and I left the remainder of my malt and any entomological civilizations that may have still been in there on the counter and left. I don't think I'll be having any more Blizzards or Dairy Queen malts for a very long time. On Sunday I sent you a note about unsanitary conditions and a dramatically unsatisfactory experience I had had on Saturday at this restaurant. I am surprised that I have had no response from you of any kind. Is it so commonplace for your restaurants to feed cockroaches to their customers that news of it does not even elicit a response from you? I look forward to receiving SOME sort of response from you. In the meantime, a photo of your cockroach is posted on my website." That was on Tuesday, just before Thanksgiving, and we went out of town for the holiday on Wednesday afternoon. When I got home from work on Monday after the holiday, there was a message from DQ on my phone at home, and on Tuesday I got an email too. I called the phone number but by the time I got around to it, it was past 5:00 pm and there was no one there. On Wednesday morning I got a phone call at work. The caller apologized for my experience; he said that they had sent inspectors to the Virginia Avenue DQ store and had not found any problems of a "systemic" nature. I respectfully disagreed with their conclusions, and pointed out a few additional observations which I have not included on this web page. He then asked me if it would be okay for him to send me a Dairy Queen gift certificate by way of making amends. 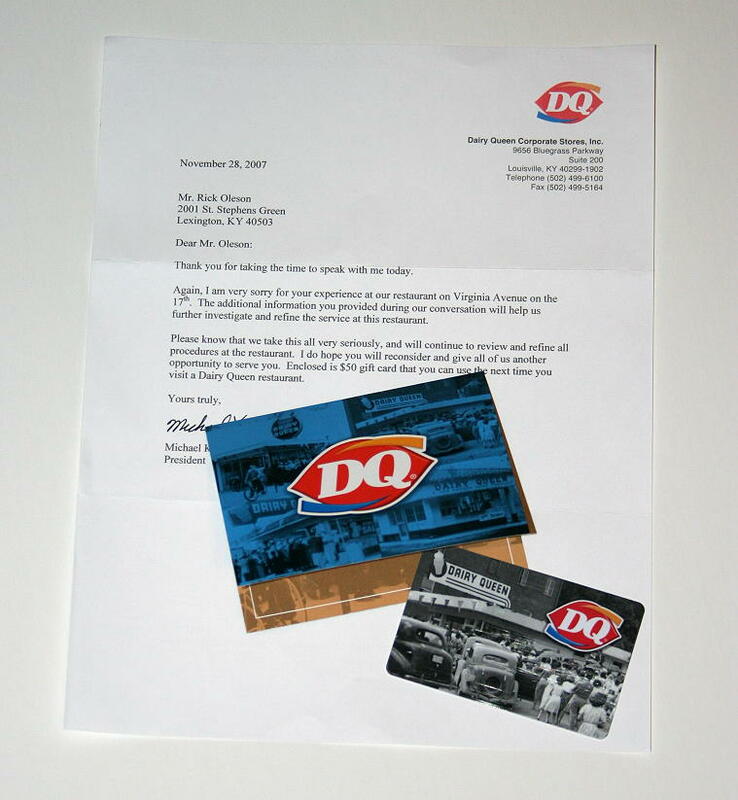 I told him that they could send whatever they like, but that I could not offer any assurance that I would use a DQ gift certificate. Although this response seemed entirely reasonable to me, he sounded a little disappointed by it. He then asked me "what my plans were" for this web page. I told him that I wasn't sure what he meant by the question. He replied that, while he had the greatest respect for the "freedom of the internet" .... he was interested to know what my plans were for this page. I asked him if he was asking me to take it down. He replied, "we'd appreciate it, yes." I told him that there would probably be some changes to the page over time, and that its prominence on my website would probably gradually decrease. In particular, I told him that I was thinking about taking the cockroach photo off of my home page, because it was making me a little bit sick every time I visited my web site... but as far as actually taking the page down, no, I didn't have any plans to do that. He sounded a little disappointed by this response as well. Being that I'm not prepared to go into a Dairy Queen restaurant, I decided to hold a little mini-auction at work (including full disclosure of the circumstances behind it, of course). It ran for one week, and on Friday afternoon the winner received the letter, the gift card, and a nice color photo of Fred, all in exchange for the surprisingly generous amount of $35. Which my wife and I used the next evening toward a filet mignon dinner at the LongHorn steak house. Best Dairy Queen meal I've ever had! VIRGINIA AVENUE DAIRY QUEEN WINS SIX AWARDS! What is DQ's food safety record REALLY like?